is one of the leading companies in transport and freight forwarding in Lithuania. The company was established in 1995 with initial fleet of 10 trucks. TRANSMĖJA is constantly growing and renewing its truck fleet and incleasing the competence of employees. Over 24 years of activity TRANSMĖJA has grown to 850 employees and more than 400 vehicles. Our work experience gained within 24 years of our operation enables us to work professionally and solve competently arising problems. We are proud of long-term cooperation and growing number of customers, including well-known Russian and European companies. We communicate with our clients in Russian, English, German, French, Spanish, Polish and Italian. TRANSMĖJA – trustworthy Lithuanian carrier with extensive experience in the international market. Own fleet allows us to provide the service without any intermediaries, saving customer’s time and money, quickly and efficiently fulfilling your requirements. The tracking system ensures constant and accurate truck traceability. Strategic location in Lithuania allows us to provide efficient service between Western Europe and the CIS countries. Forwarding department is able to provide the required type of transport quicker and from various locations. COFACE – commercial risk leader in the world, certified TRANSMĖJA as a stable and reliable company. 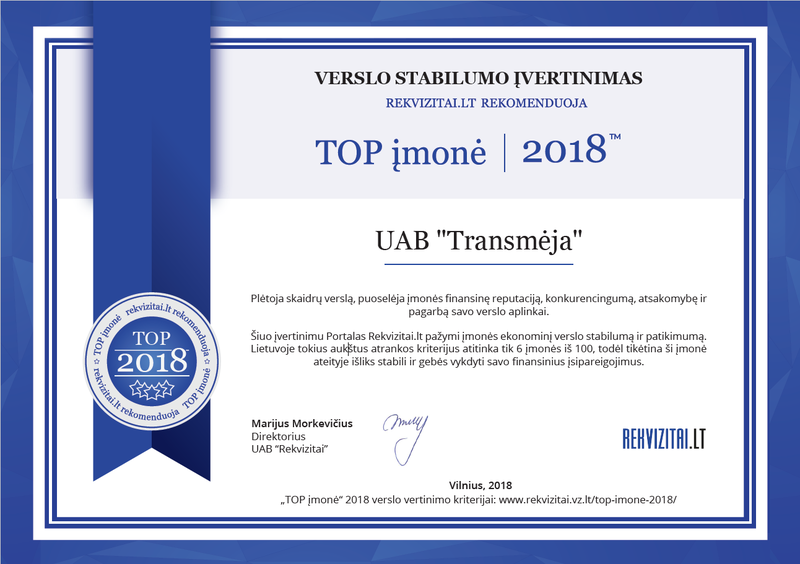 Every year land transport enterprise TRANSMĖJA is awarded certificate “The Strongest in Lithuania” by credit bureau CREDITINFO. They certify high solvency rating of the company. Only 5 percent of Lithuanian companies are honored with this name. 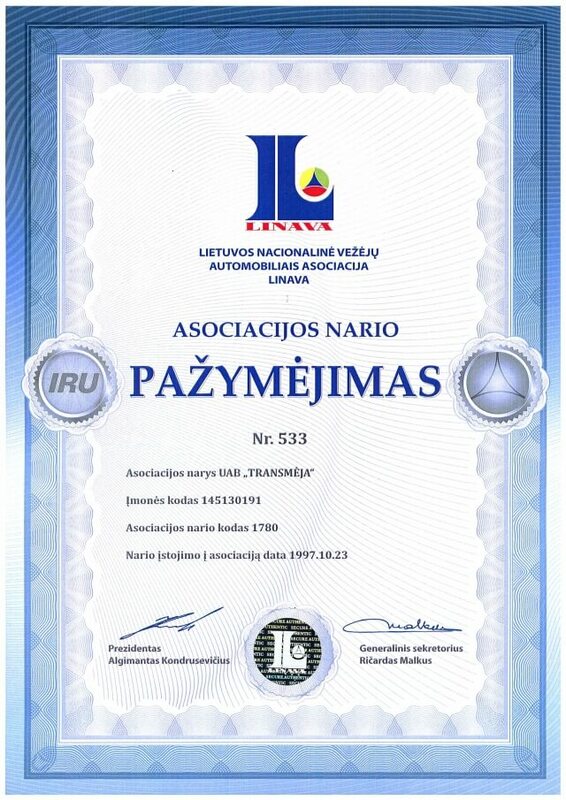 Company pertains to Lithuanian National Road Carriers Association LINAVA. 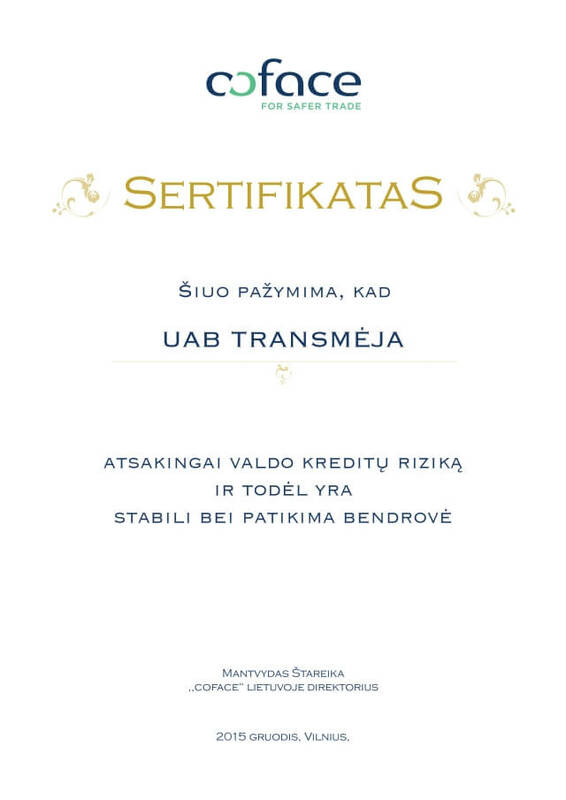 TRANSMĖJA pertains to Siauliai Chamber of Commerce, Industry and Crafts. 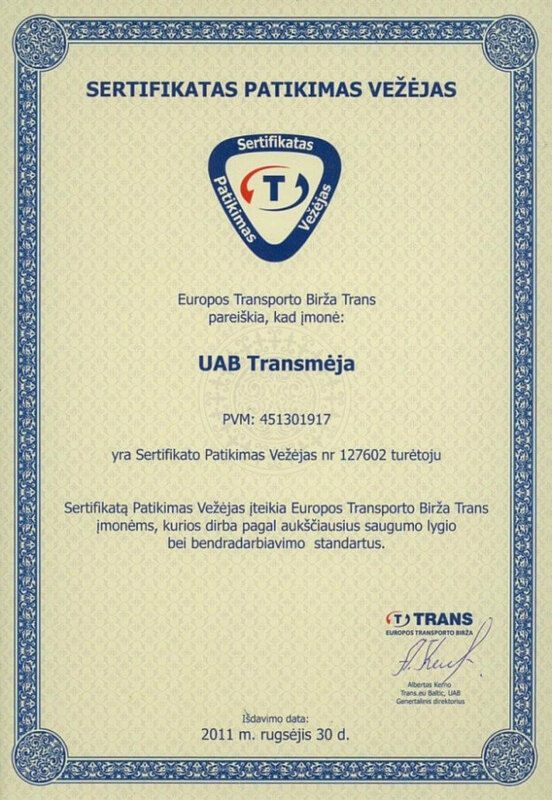 TRANSMĖJA has been honored with certificate “Trustworthy Carrier” by European Transport Exchange TRANS. This certificate is given to companies complying with the highest security level and partnership standards. During 2018 carrier TRANSMĖJA has shipped more than 45 000 loads, reaching the turnover of well over 50 million Euros. During 2017 carrier TRANSMĖJA has shipped more than 39 000 loads, reaching the turnover of well over 40 million Euros. During 2016 carrier TRANSMĖJA has shipped more than 22 500 loads, reaching the turnover of well over 34 million Euros. The company is a member of the Lithuanian National Road Carriers Association Linava, Šiauliai Chamber of Commerce, Industry and Crafts, TRANSMĖJA participates at international exhibitions in Russia, Kazakhstan, Germany. This road transport company has been assessed very highly by commercial risk experts. 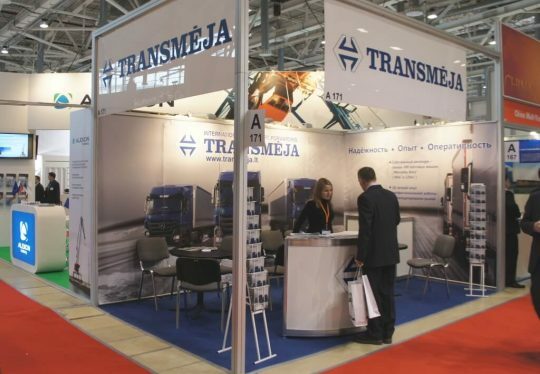 In 2011 and 2013 TRANSMĖJA took part in international exhibition “TransRussia” in Moscow (Russia). In 2015 and 2017 the transport company participated in the biggest transport and logistics exhibition in Europe – “Transport logistic” in Munich (Germany), etc.